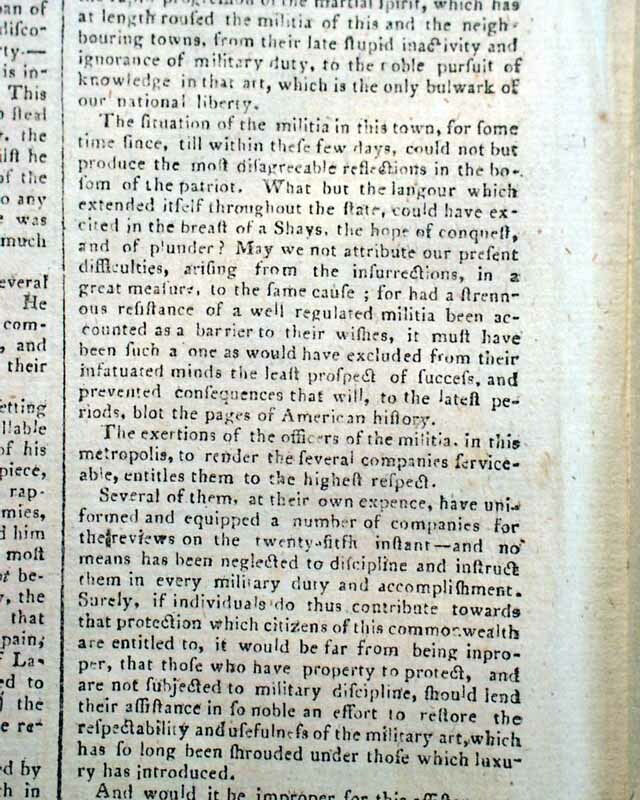 An exceedingly historic issue as this newspaper reports the formal beginning of the Constitutional Convention--terrific to have in a newspaper from the city where these notable proceedings were held. 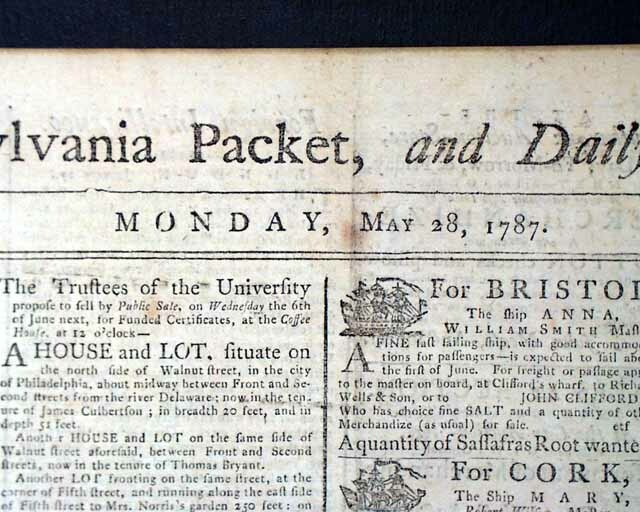 As such, this is likely the first newspaper to report this event, which significantly includes the election of George Washington as its President. 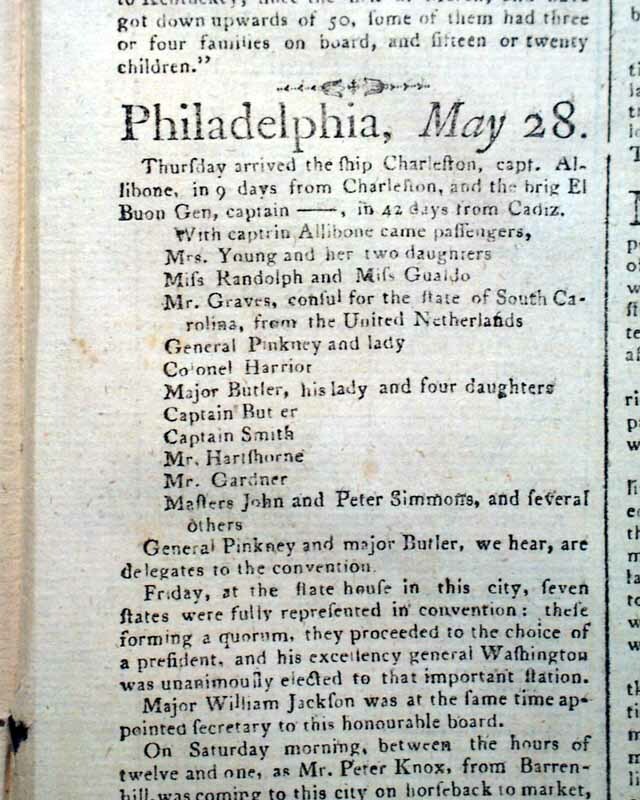 From Philadelphia is a report of various arrivals by boat, and a note: "...General Pinkeney and major Butler, we hear, are delegates to the convention. 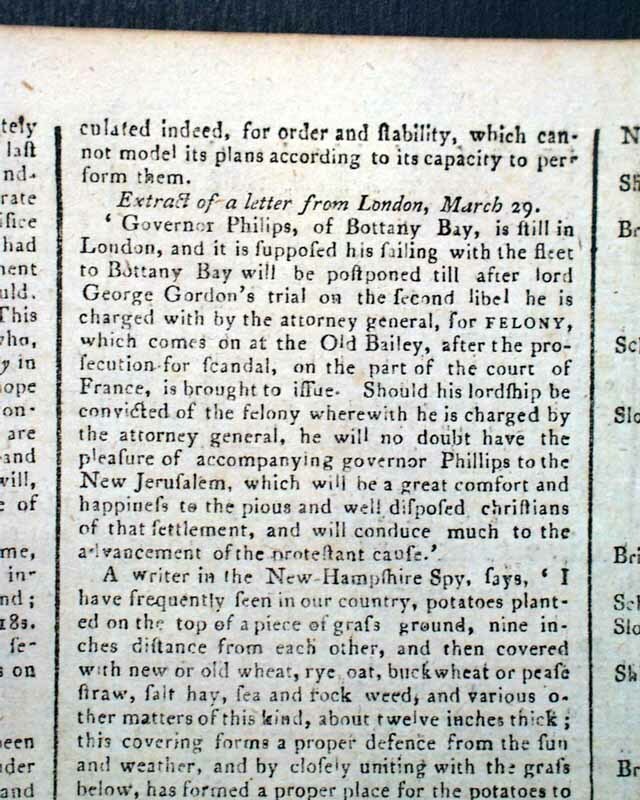 Friday, at the state house in this city, seven states were fully represented in convention: these forming a quorum, they proceeded to the choice of a president, and his excellency general Washington was unanimously elected to that important station. 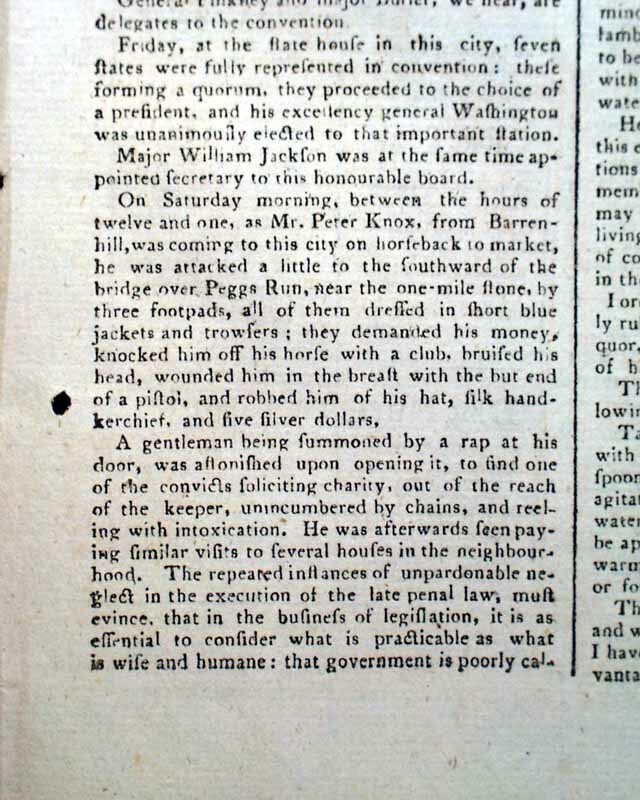 Major William Jackson was at the same time appointed secretary to this honourable board." 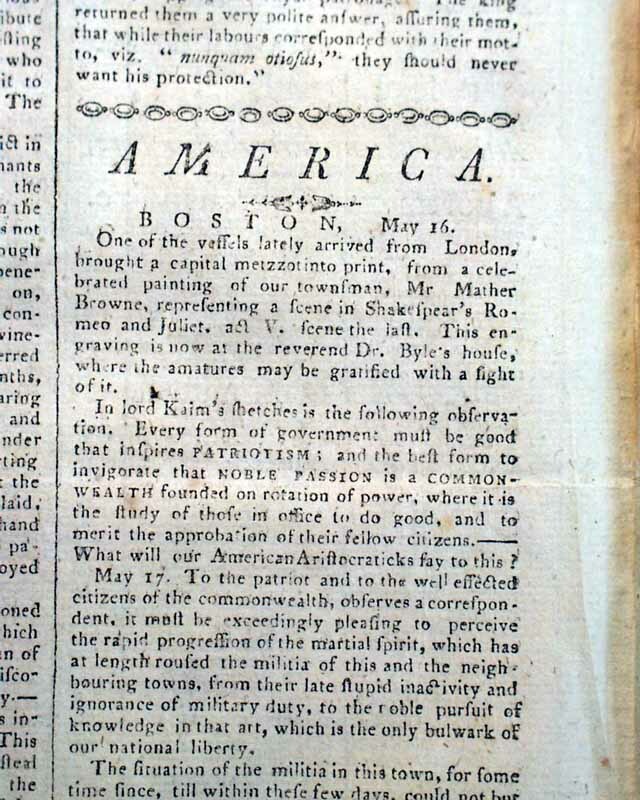 The "Friday" mentioned would be May 25 which history confirms was the date that the historic Constitutional Convention began deliberations. 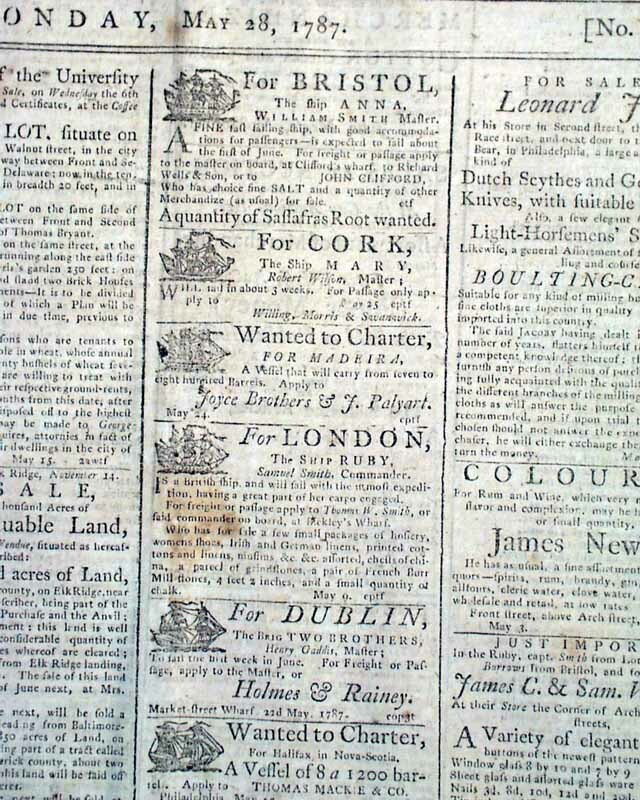 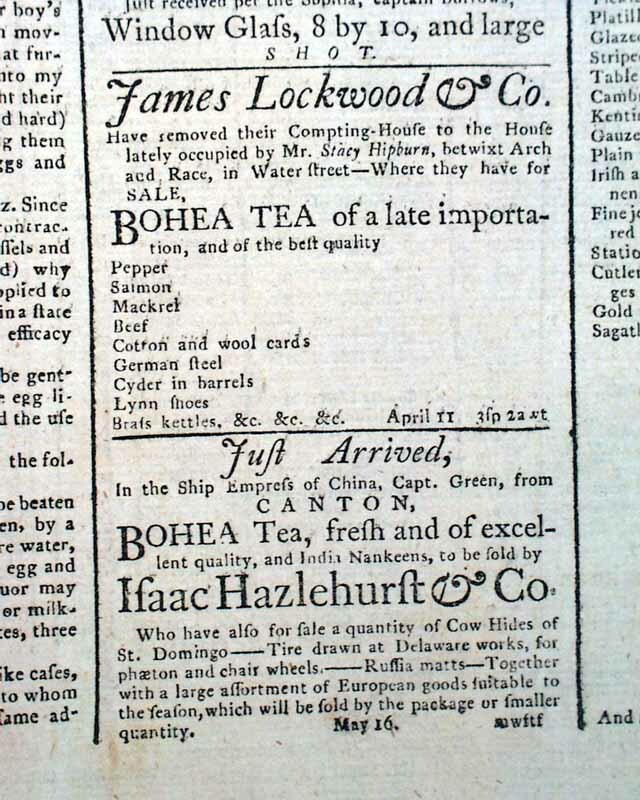 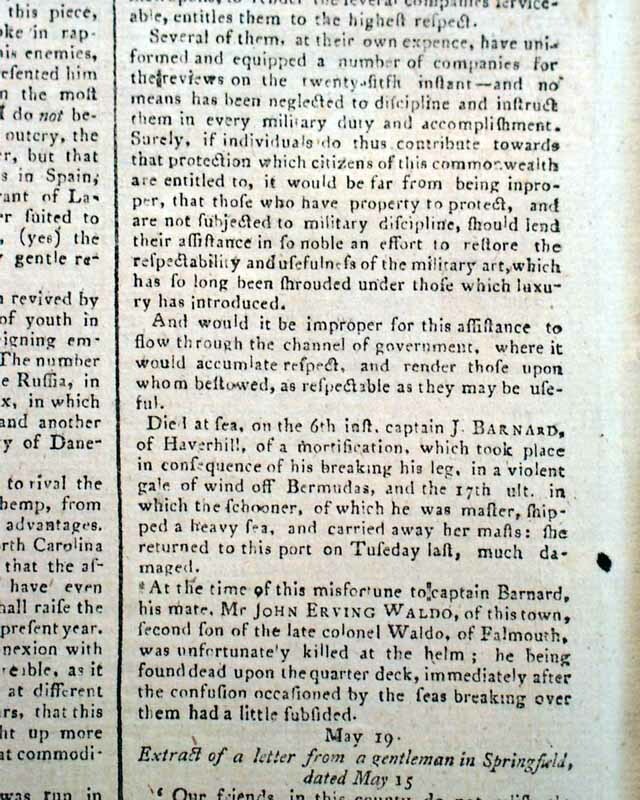 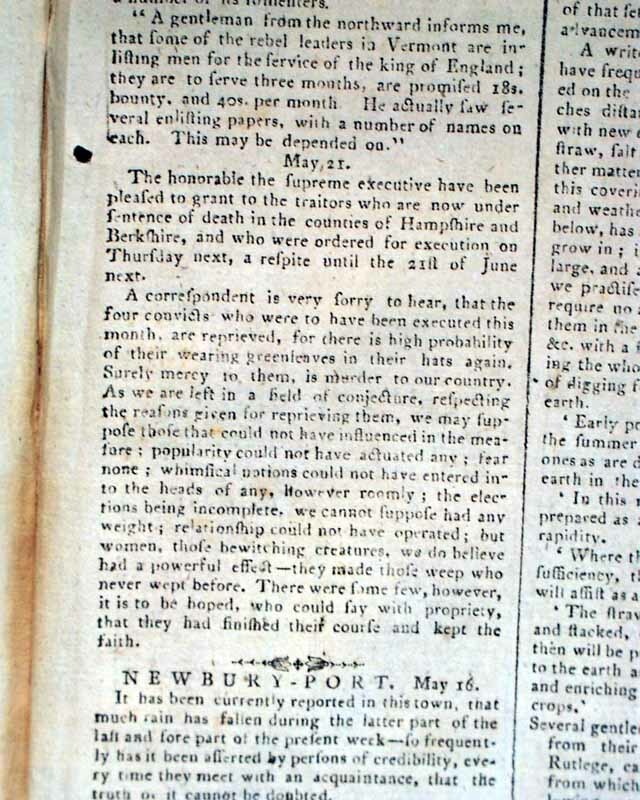 :Page 3 has news concerning the Shays' Rebellion noting in part: "...very sorry to hear that the four convicts who were to have been executed this month are reprieved..." with more. 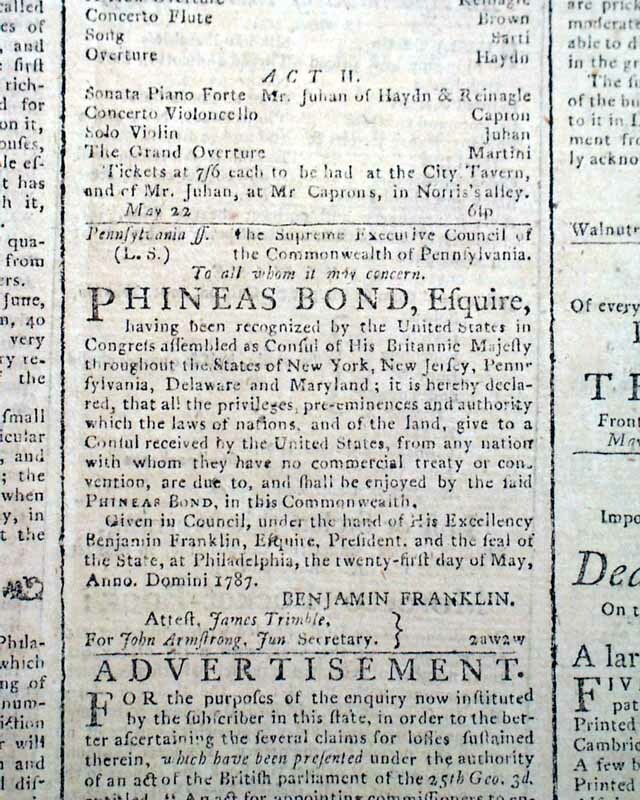 The front page has a legal notice from the Supreme Executive Council of Pennsylvania noting that Phineas Bond has been formally recognized as an ambassador from England to Pennsylvania & other states, signed in type by the Council's President: Benjamin Franklin (see). 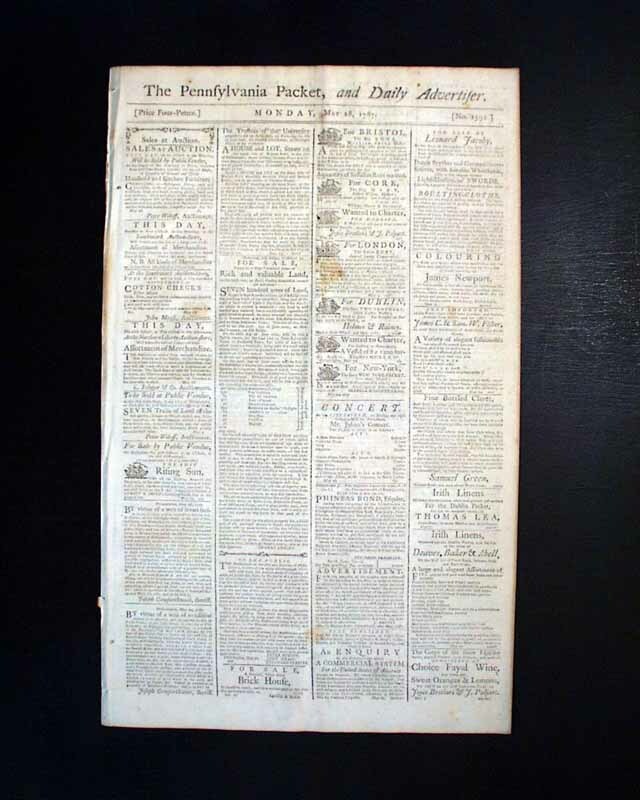 Complete in four pages and in excellent condition.